One of my favorite ways to cook outdoors is on our Camp Chef. It’s like cooking on a gas range, but it can go camping with you! Who wouldn’t like a Camp Chef Stove in the backyard or to take camping to cook outside. Can you smell the bacon, eggs and hashbrowns right now? Well, I’ve teamed up with some blogging friends again to bring you TWO chances to win a Camp Chef stove of your very own! These stoves would make a great gift for Father’s Day! 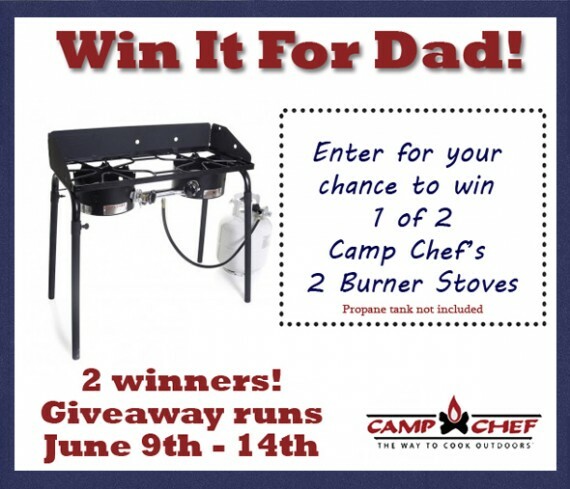 The Father’s Day CampChef giveaway runs through this Saturday, June 14th, 2014 at 5:00PM (MDT). We will have two winners and each one will receive one CampChef 2 burner stove Model #EX60LW. This giveaway is open to residents living in the 48 Continental U.S. (stinking shipping is a killer anywhere else!). This giveaway is open to anyone 18 years of age and over. We will choose 2 winners at the end of the giveaway and notify the winners by email to the address you provide to us. Please use an email you check regularly and please check your email as well as your spam! Each winner will have 48 hours to respond to the email. If the winner does not respond within the 48 hours allowed we will choose another winner. **Please note the propane tank is not included in the giveaway. Good luck to all and Happy Father’s Day to all of you! We so want this for canning! I do have a US shipping location to ship things to.. So you don’t have to worry about shipping costs..
We have one of these. My scoutmaster hubby got it and uses it every summer. We even used it several times when the power went out. Whoever wins will love it!